HomeWin a Signed Football and Help Fight Child Abuse! Win a Signed Football and Help Fight Child Abuse! Per our previous post, next Saturday (1/21) we will be hosting our Casino night to raise funds for RAINN as part of the National PSU Pride event. 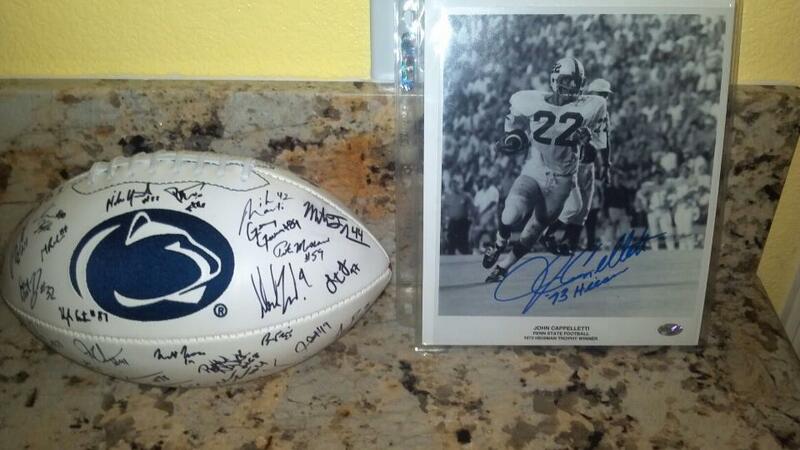 To add some extra incentive, Mike Henkel has procured the following autographed items. 1. PLAY! – Buy-ins are $25 and you get an equivalent amount of chips. All monies go to RAINN however your winnings get converted into raffle tickets. Don’t worry if you lose your shirt, you will have a minimum of 5 tickets entered just for playing. Please RSVP to Mike at lionsgrad2011@gmail.com and click here for the flyer. Obviously players will have a better chance of winning so our preference is that you come out to the event. Thank you for your continued support of this very important project! Just an update. We raised over $600 for RAINN. Thank you to everyone who came out and played as well as those that sent check donations. 100% of this money will go to help fight Child Abuse.